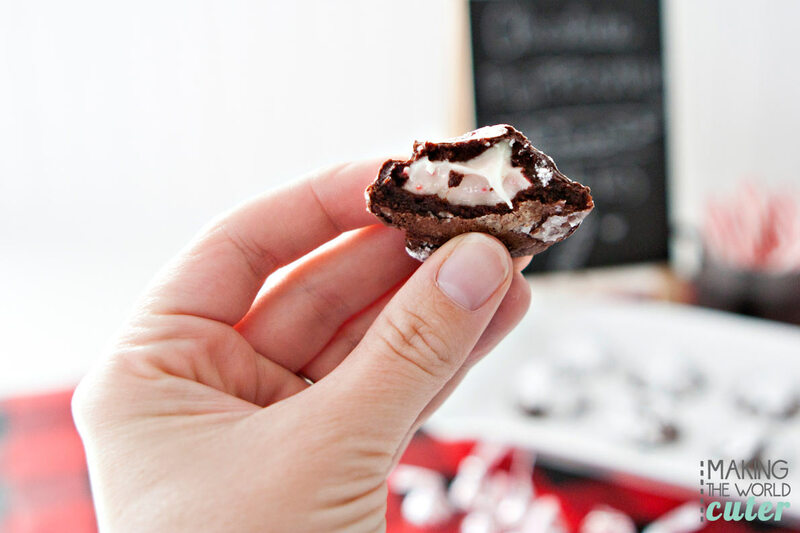 These cookies are like a little chocolate peppermint kiss that you will want to take under the mistletoe! Ha! 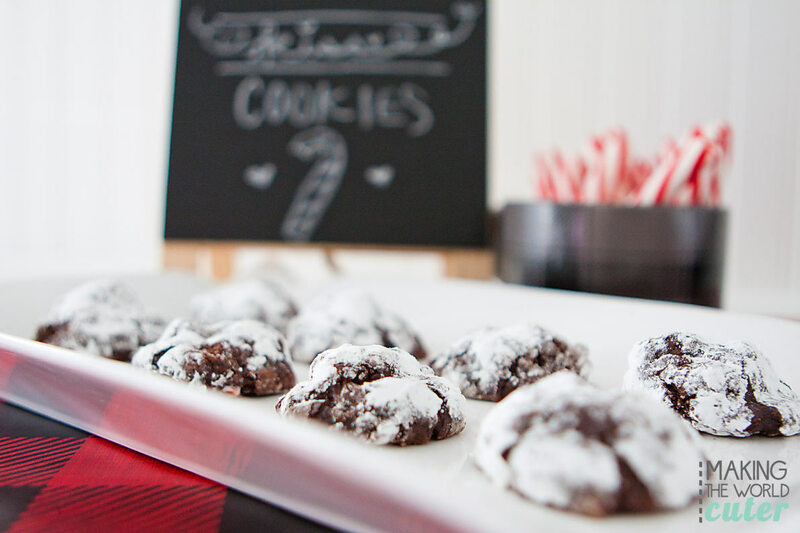 When I think of Christmas, I think of cookies…baking them as a kid with my mom, baking them with my kids now, baking them for neighbors and baking them for exchange parties. Baking, baking, baking! Cookies, cookies, cookies! My pantry is so stocked with chocolate chips and other baking essentials that you would think that I was stocking up for an upcoming chocolate shortage…luckily I don’t see that being a problem, but if it is, you can come to my house, I’ll share! One of my favorite things about the holiday season is making cookies with my kids. They love to help, I love to bake and everyone loves to eat! 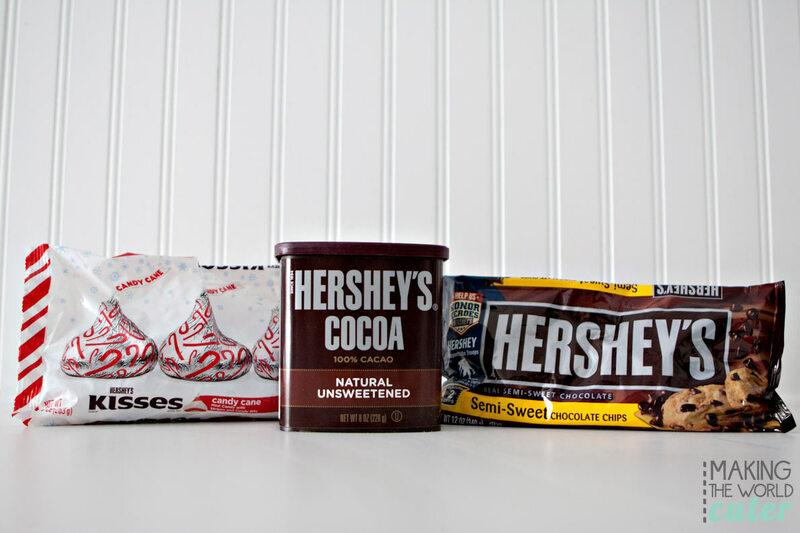 I was asked by The Hershey Company to come up with a recipe using some of their delicious ingredients…and well that wasn’t hard at all! You can’t think of chocolate without thinking of Hershey’s right? My most very favorite holiday candy is the Hershey’s Kisses Candy Cane Mint chocolates. I usually get 3 or 4 bags in my stocking each year, no lie. When I see them come out in stores I always grab a bag…even if it’s before Halloween. I don’t care about following the candy timeline rules, I’m a rebel. These cookies are good. I’m talking, your friends will beg you for the recipe, good. 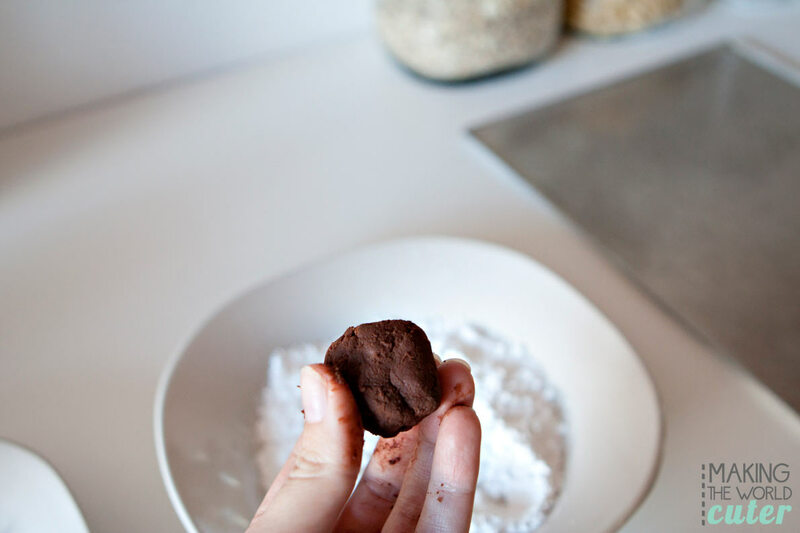 And they are flourless, so your friends that don’t eat gluten will be able to enjoy them as well, which makes them the perfect cookie to bring to an exchange, or add to a Hot Chocolate Bar. 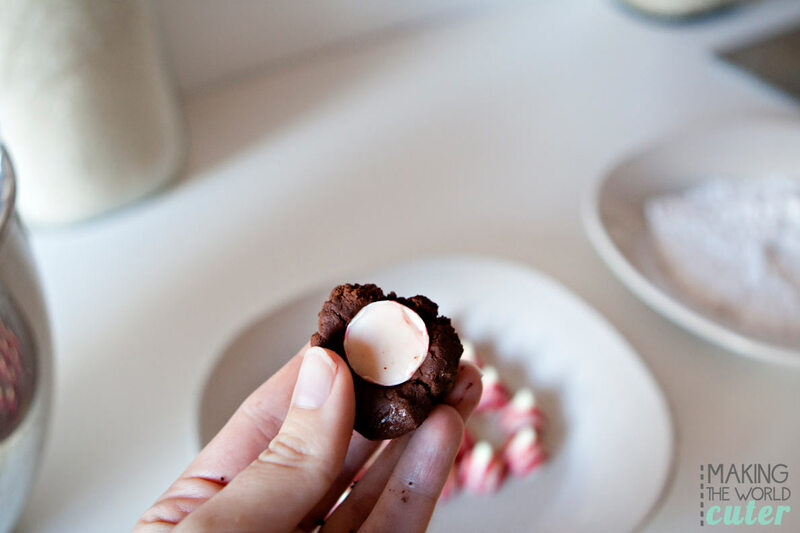 I adapted a recipe that I wrote down from Divine Baker to make these more Christmas-y. 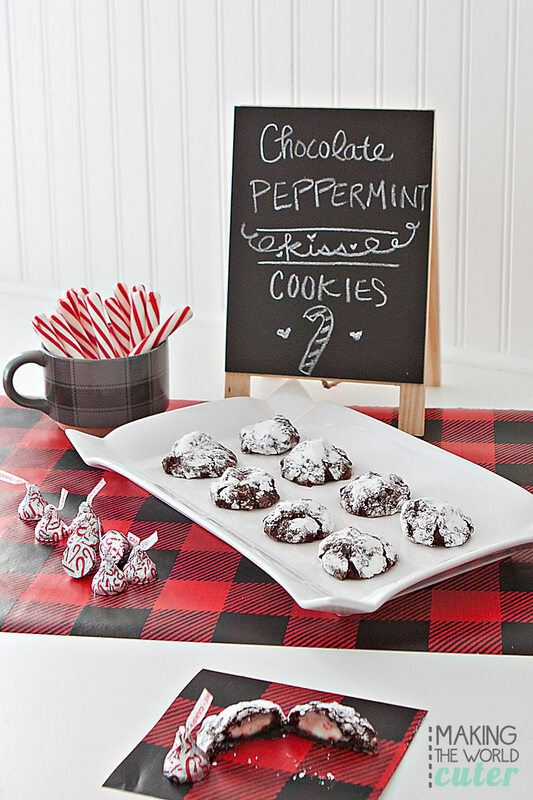 They are also the perfect cookie to let your kids help…lots of kid friendly tasks! The first thing you need to do is unwrap 24 Hershey’s Kisses Candy Cane Mint chocolates…my little guy Oliver was all over helping me with that. Of course he opened closer to 30, so we might have had to eat a few! Darn! 😉 Then you will want to preheat your oven to 350, and grease a couple of cookie sheets. Next you will put three egg whites at room temp into your mixer with 1 cup of powdered sugar and let your mixer go to work while you do the next couple of steps. I let Oliver watch the mixer at this point and tell me when the mixture turned into a creamy white “frosting.” That way I could get the next two steps done without interference. 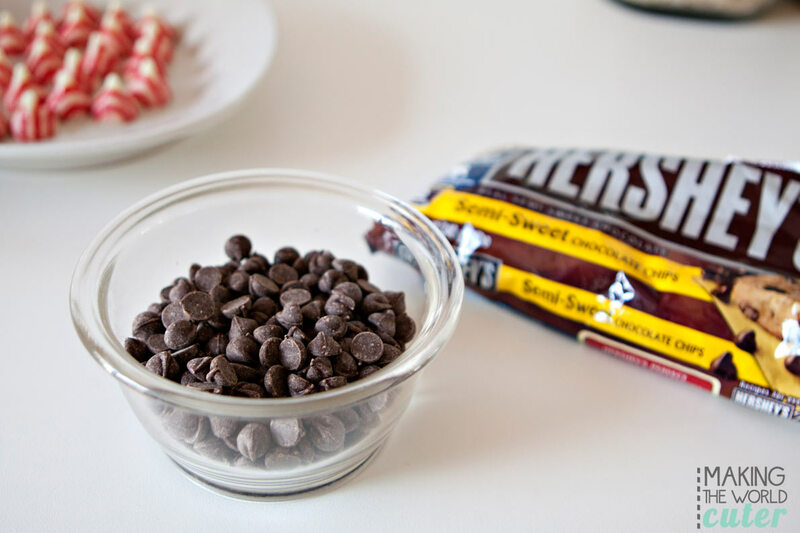 In a glass bowl melt 1 cup of Hershey’s Semi-Sweet Chocolate Chips in the microwave, in 30 second increments, stirring between sets. My microwave did it in 1 minute. Set bowl aside. 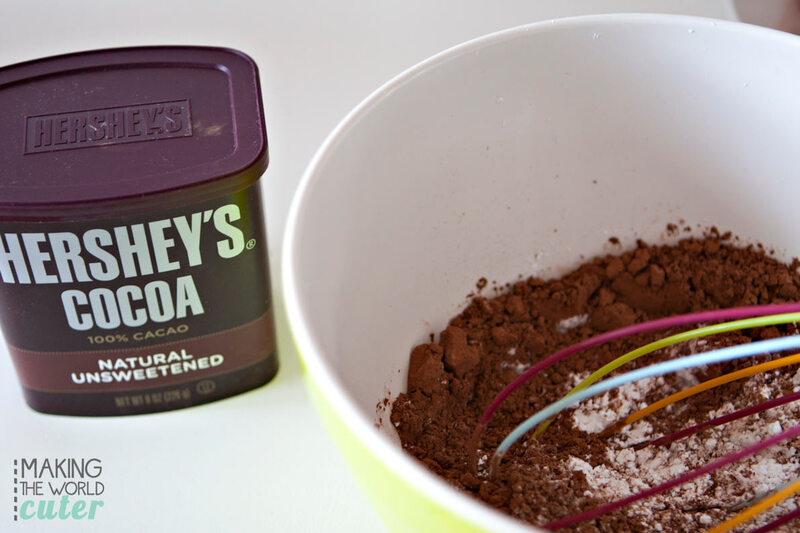 Then you will need a mixing bowl to mix your dry ingredients; 1 cup of powdered sugar, 1/2 cup of Hershey’s Cocoa Powder, 1/4 tsp of salt and 1 TB of arrowroot starch (or cornstarch). I use arrowroot starch always just because I used it when I was eating a paleo diet and really liked it, but cornstarch will also work with this recipe. Use a whisk to combine the dry ingredients. 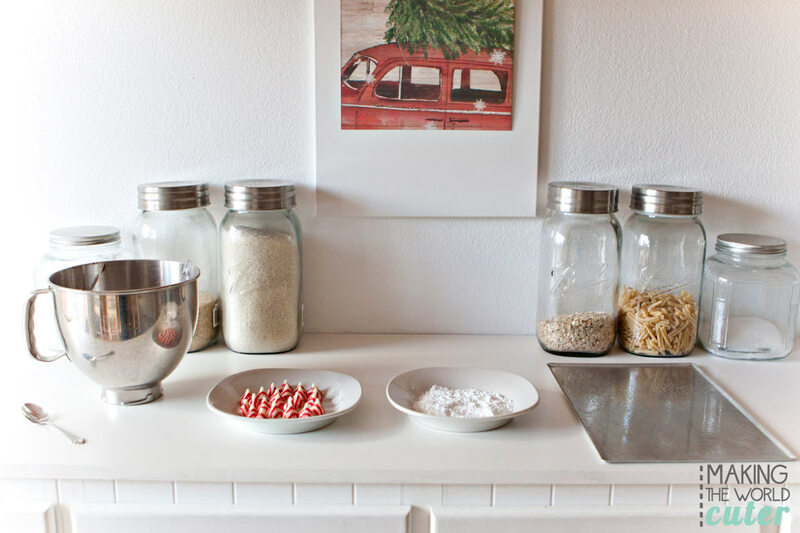 So now you will have three bowls of ingredients…time to add them all together. First add the dry ingredients and mix them until well combined. Then you’ll add the melted chocolate chips. 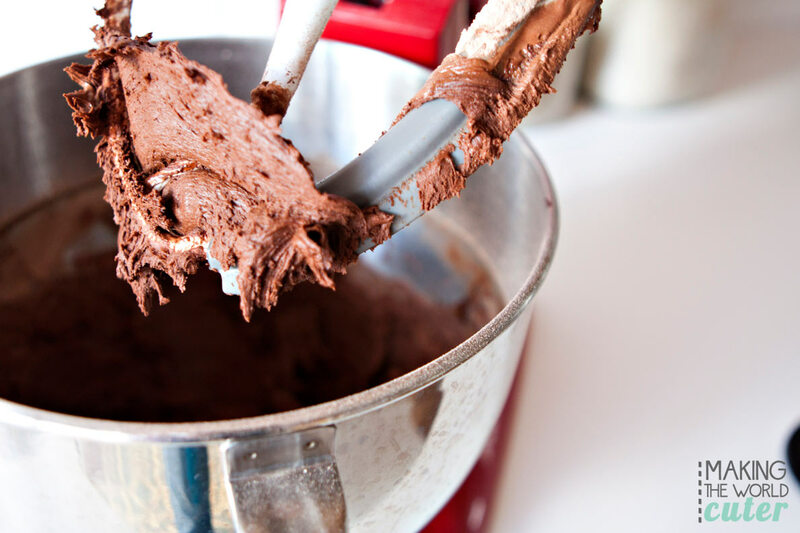 When it is mixed it will look like a thick fudgy frosting. It will also taste delicious if you lick the beater. Not that I would suggest that because of the raw eggs, but if you dare to live on the edge…yum. Now I set up an assembly line, and here is another place where the family can jump in and help. Lots of little jobs! 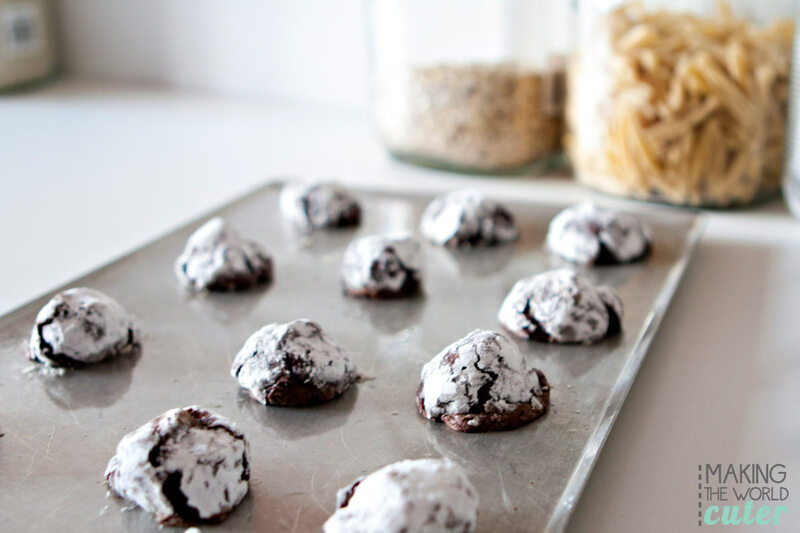 You’ll need a spoon, your dough, your Hershey’s Kisses candies, a plate with about a 3/4 cup of powdered sugar on it, and your greased cookie sheets. 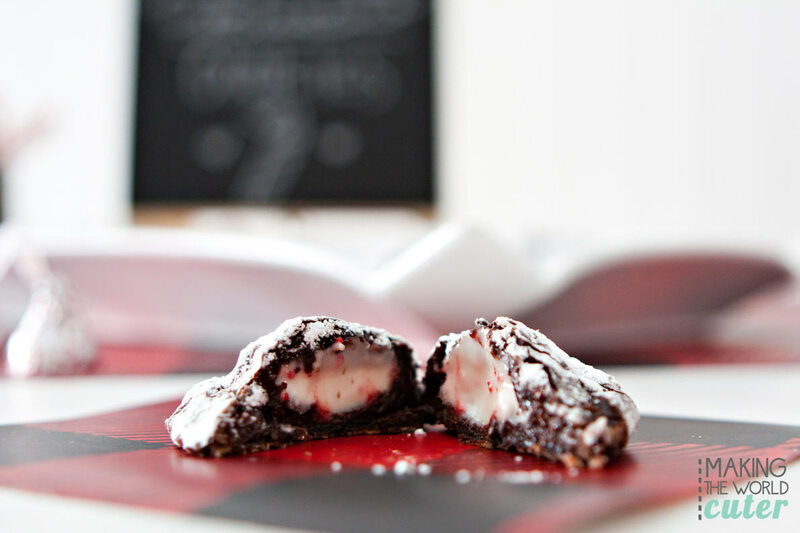 First take a spoonful of dough, roll into ball and then stick your chocolate peppermint kiss into it. Next, make sure that the candy gets completely covered in dough. 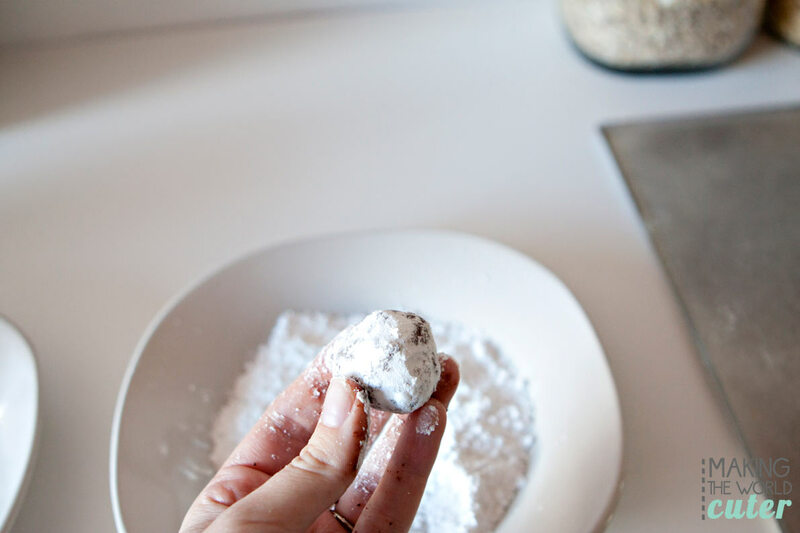 Then, roll cookie in the powdered sugar and completely coat. Finally, place on greased cookie sheet. You’ll want to place them at least an inch apart. Then you will bake them for about 8 minutes, they won’t look much different than the dough versions, just a little flatter. Leave to cool on pan for about 10 minutes (if you don’t, you’ll burn your tongue, don’t ask me how I know that), and then transfer to wire rack to finish cooling. 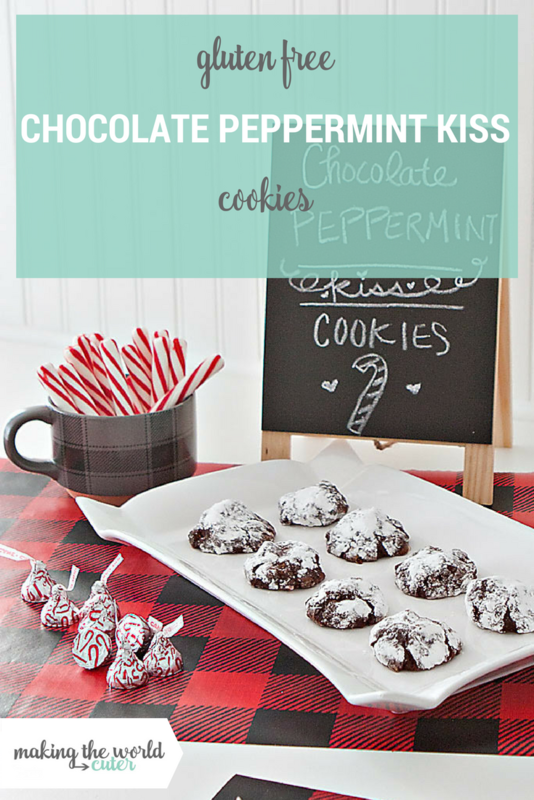 Inside they are fudgy, gooey, pepperminty, and so over the top delicious. Go on and take a bite, if you like peppermint and chocolate, then I guarantee you will like this cookie…and if you don’t, I will sacrifice and eat it for you. 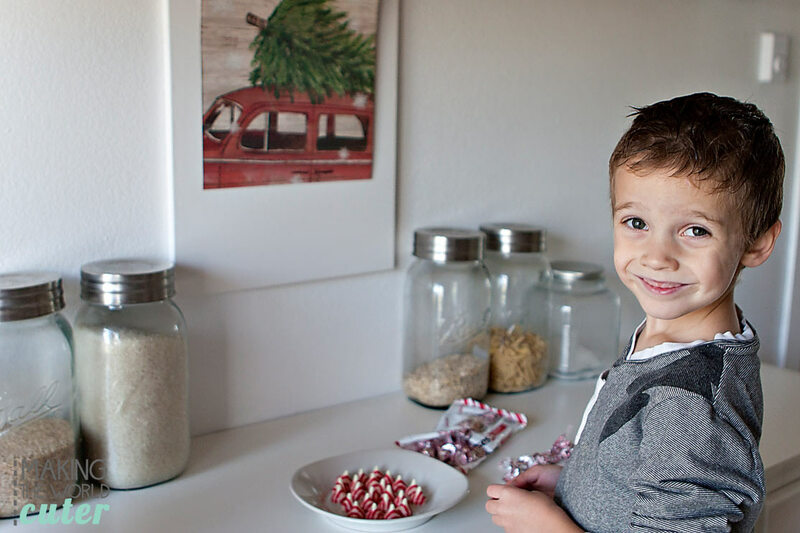 Oliver loved helping me make these and can’t wait until we make them again…and my friends can’t wait until I make them again either. We shared some and they all kind of flipped out at how yummy they were. 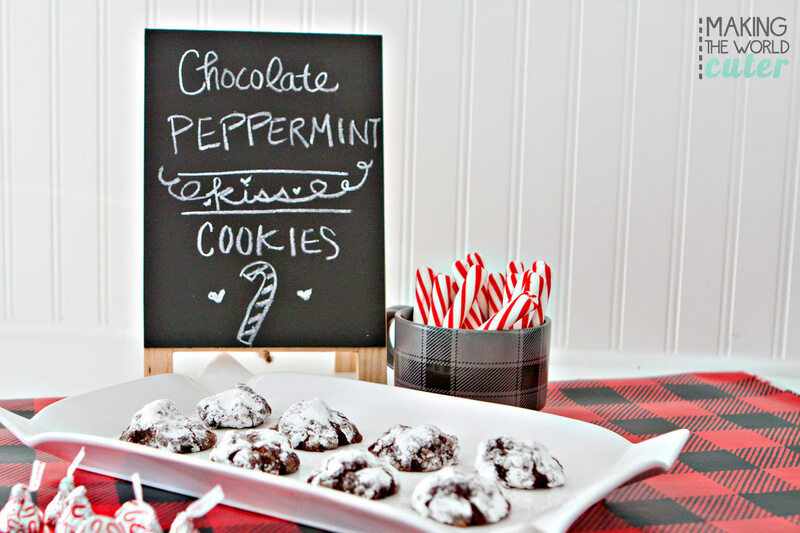 If you plan on sharing them at a party, I suggest making a label on a chalkboard for them…not only is it cute, but it also lets people know they are in for a minty surprise when they bite into it. This is one new tradition that you are definitely going to want to add to the list this holiday season! They will definitely add to the magic of the season! Unwrap Kisses and set aside. Preheat your oven to 350, and grease a couple of cookie sheets. 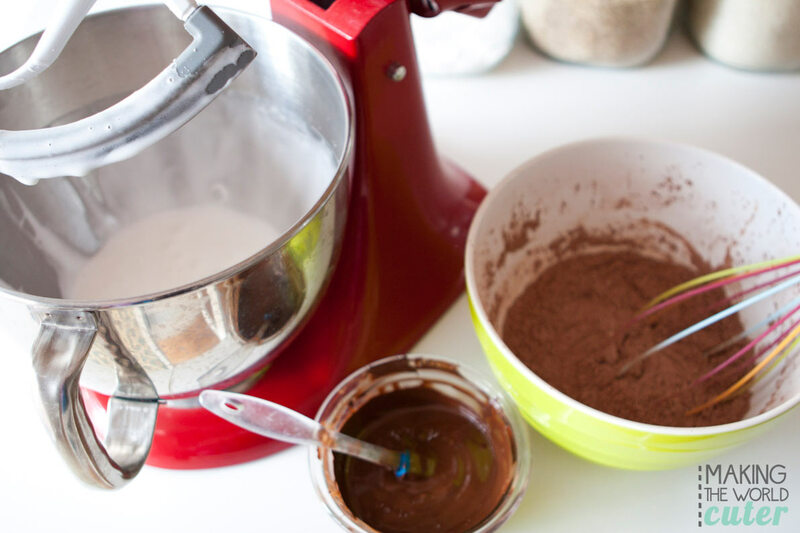 Put three egg whites at room temp into your mixer with 1 cup of powdered sugar and mix well. In a glass bowl melt 1 cup of Semi-Sweet Chocolate Chips in the microwave, in 30 second increments, stirring between sets until melted. Set bowl aside. 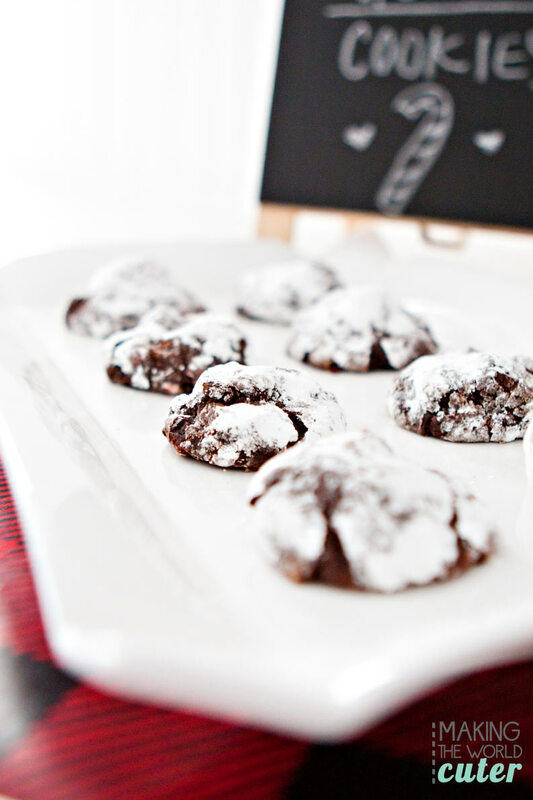 Mix dry ingredients: 1 cup of powdered sugar, 1/2 cup of Cocoa Powder, 1/4 tsp of salt and 1 TB of arrowroot starch (or cornstarch). 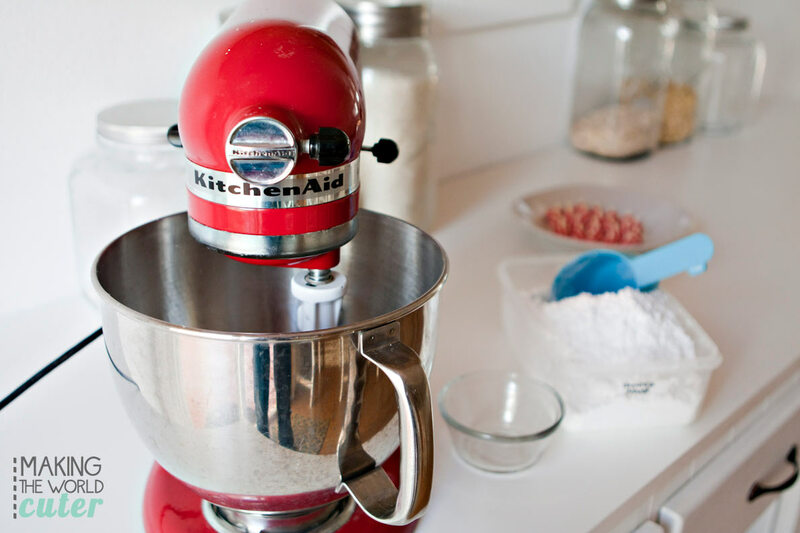 Use a whisk to combine the dry ingredients. Add the dry ingredients to the egg whites and powdered sugar and mix them until well combined. Add melted chocolate chips and mix until it looks like a fudge frosting. In assembly style fashion-roll a spoonful of dough into a ball and insert a kiss. Cover kiss completely with dough. 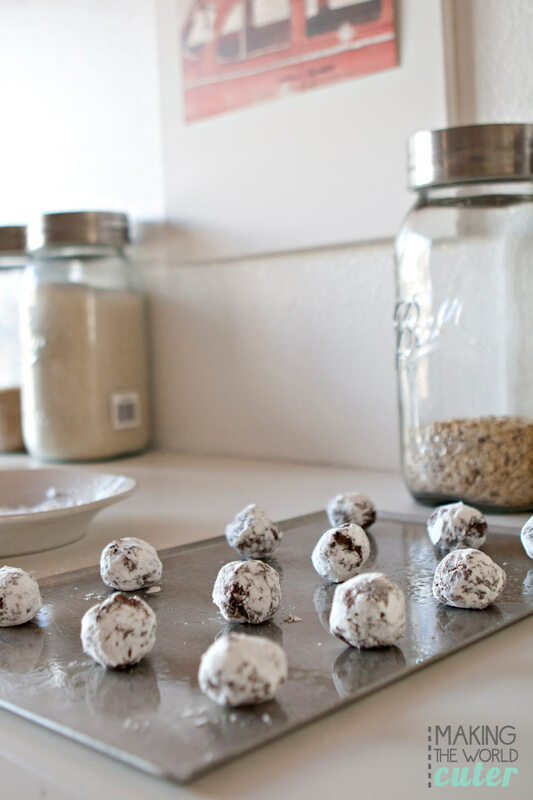 Roll cookie in powdered sugar and place on greased cookie sheet. Bake for 8 minutes and let cool for at least 10 before eating.